A fascinating museum here in Cornwall. Many North American visitors to Europe are mystified by European electricity. They have heard that their appliances won’t work and there are strange plugs and outlets. So I will tell you how I deal with electricity here in Spain. The first thing I do is look at the specifications of any electronic device I own. You may need a magnifying glass to read the specs because they're often printed in microscopic type. Pick up the device and start looking for very small print in an obscure location, usually on the bottom or back. The word you are looking for is “input," followed by some numbers. If those numbers are “100 volts to 240 volts” you are in luck. Your device will work just fine in Europe. If you don't see “240 volts,” things are more complicated. Voltages in Europe are nearly always 220 volts, so your US 110 volts devices won’t work here. Actually, these days nearly all high-tech gadgets such as smart phones, computers, and tablets have the 100-240 volt specifications. The main reason for this is that manufacturers want to be able to sell their products all over the world so they need to work on a variety of voltages. An exception is our electronic tooth brush. The chargers we have found are all single voltage so we have had to purchase two chargers or rely on the dual voltage outlets on some hotel bathroom mirrors. Some gadgets, such as electric hair dryers, have a switch to change from US to European voltage, which is very convenient. Look for those switches when you purchase your next hair dryer. Now that the voltage issues are out of the way, it's time to plug it in. 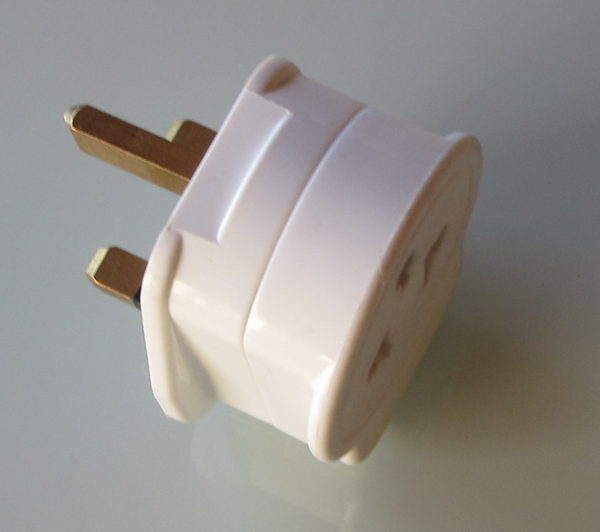 The plugs we are all familiar with in North America are never used in Europe. One simple solution is to purchase an adapter for each country or region you plan to visit. These adapters are sold in travel stores in the US and many hardware stores in Europe. It's best to purchase them in the US before you travel. That way you won’t have to figure out where to buy them when you get here. A more sophisticated solution is to purchase one of the “universal” adaptors. These look fine in principle, but I’ve found that some don’t really work with all European plugs, so let the buyer beware. The solution I have come to trust is a universal power strip. I have two of these gadgets and they have never failed me. By now, I have electronic gadgets with many different plugs and the universal power strip takes them all. Look at the pictures below to see what they look like. I’ll put up a link to a site that sells them (no advertising revenue comes to me for this URL site). The plug on these power strips is standard European, so when I travel to England I need a UK power adaptor. So once you have the proper adaptors and the right electronic gear, you are set to go. Bon voyage!